[dropcap letter=”T”]he Korean indie band Busker Busker was right about night sky above Yeosu, but there is so much going on in the area before those lights come out. 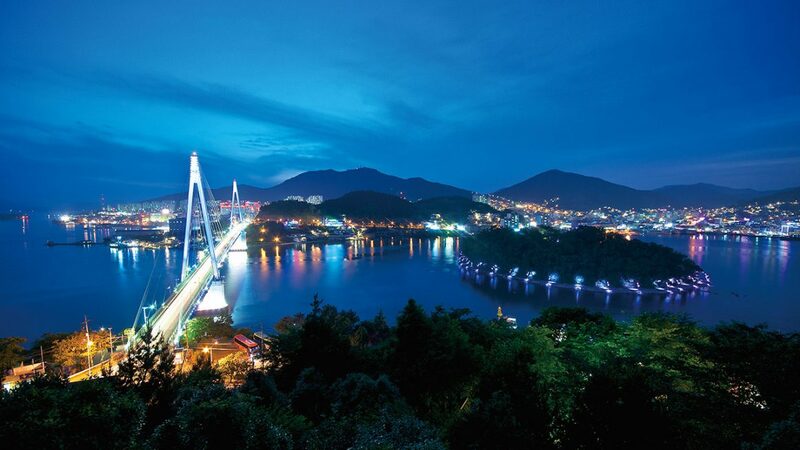 Yeosu is a city reborn since the World Expo was held there in 2012; after the city spent six months serving as a hub for visitors hailing from around the globe, the locals noted that that Yeosu feels more developed and worldly, despite its simple coastal charm. The entire Korean Peninsula is a historical treasure trove, but Yeosu citizens are especially proud of their city’s place in the development of the nation: The region once served as a base for Admiral Yi Sun-sin, the 16th-century naval hero renowned for his many victories over invading Japanese forces during the Imjin War (1592-1598). Reminders of the country’s most famous naval hero can be found all over town, a testament to local enthusiasm for his military accomplishments. One of the best places in the city to start your visit is Jinnamgwan, the site of Yi’s headquarters, which offers visitors the chance to step back into the original architecture of the admiral’s heyday. After walking through the gorgeous, open-air hall, head toward the water for a stroll around Yi Sun-sin Square and explore the harbor. The iconic Dolsandaegyo Bridge and Turtle Ship replica seen in this area are responsible for Yeosu’s famous “night view.” Other historical hot spots include the Seonso Shipyard, which was once tasked with building the boats that fought back against the Japanese during the Imjin War. When you’ve had your fill of battle relics, walk or cycle along the sidewalk from Seonso in the direction of the Soho-dong Yacht Marina for a cool evening along the water. 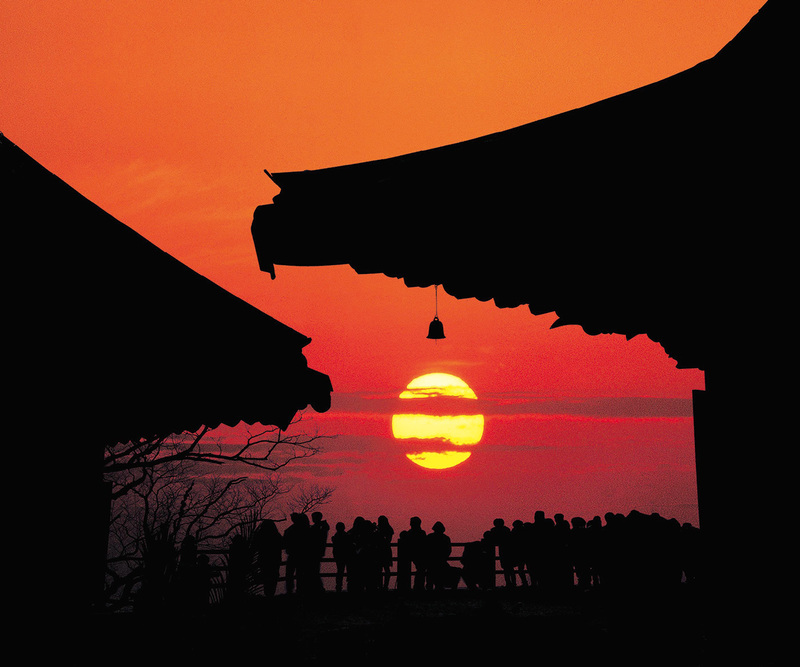 While you’re in the Yeosu area, be sure to spend an afternoon at Heungguksa Temple, a beautiful worship site nestled in the foothills of Mt. Yeongchwisan. Aside from green-canopied paths and its friendly dogs, Heungguksa Temple is yet another site in the region that has played a prominent role in Korea’s past: Over 300 monks were trained for battle here during the Imjin War, an honorable act that reflects the dire situation of the time. Once you’ve finished learning about Yeosu’s historical significance, find a good vantage point to take in the spring time sunset from one of the mountains that surround every neighborhood. Each peak promises a distinct yet spectacular view, but the most convenient place to take in Dolsandaegyo Bridge and the rest of the Yeosu area has long been the top of Mt. Gubongsan, a mountain that is perfect for night hikes. More recently, however, an increasing number of vista-seekers have been crossing the “Night View” bridge to Dolsan Park and enjoy a cable car ride to the Expo site. Walking around the Expo former grounds is a treat in itself, as the crowds that once flocked there to experience a truly international atmosphere are long gone. What remains three years later is a beautiful park that begins out the Yeosu Expo KTX Station and extends all the way to Odongdo Island. As water and mountains dominate the Korean Peninsula at every turn, Yeosu is a haven for hiking enthusiasts. The aforementioned Mt. Gubongsan is best for more central Yeosu (Yeoseo-dong and the harbor), but further north in Yeocheon, Mt. Ansimsan is best. There, trekkers can see the Seonso Shipyard and the Soho Yacht Marina from a more elevated perspective. 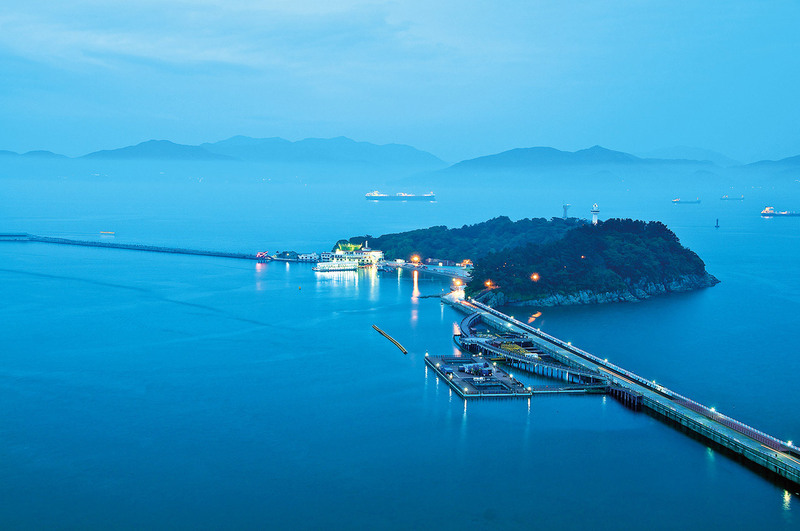 The fun isn’t restricted to the mainland, however, as the 300 islands that surround Yeosu are the perfect choice for a day trip or night of camping. Dolsando Island is the closest to the city, enveloped by quiet beaches and offering a glimpse of local fishing traditions. 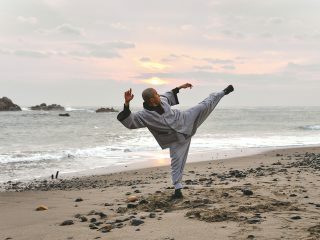 At the southeastern tip of the island is Hyangiram, a beautiful temple overlooking the ocean. Don’t just come for the views, though – the food hawkers outside will try to convince you to try some of Dolsando’s famous gat kimchi, and you should let them. Stay at a minbak and wake up to a beautiful sunrise; the unobstructed view has made this area one of Korea’s most popular destinations for watching the sun come up on New Year’s Day. If you’d prefer to move around a bit, catch a ferry from one of Yeosu’s numerous terminals and do some island hopping – a great way to explore local culture. Sado Island is fun for families and beachgoers who are looking for beaches and remnants of dinosaur footprints, while Geumodo Island’s Bireong Road is an especially popular destination for a day hike. Be sure to pack some kimbap, water and snacks for your trip, as amenities are limited (and sometimes nonexistent) after you leave the mainland. The pre-summer months are a bit cool for the beaches in Yeosu, but you can still get out on the water for some exciting action in a motorboat. The drivers, who are located at the entrance to Odongdo Island (adjacent to the Expo), can be seen waiting near the shore and shouting “Motorboat!” at passersby. Spring crowds are just starting to awake from their winter slumber, so wait times should be minimal. With four to five people, prices are under KRW 10,000 per person, making for an affordable yet fun way to enjoy the harbor front. Bundle up for the fast ride around the island, as that March air is a bit chilly! 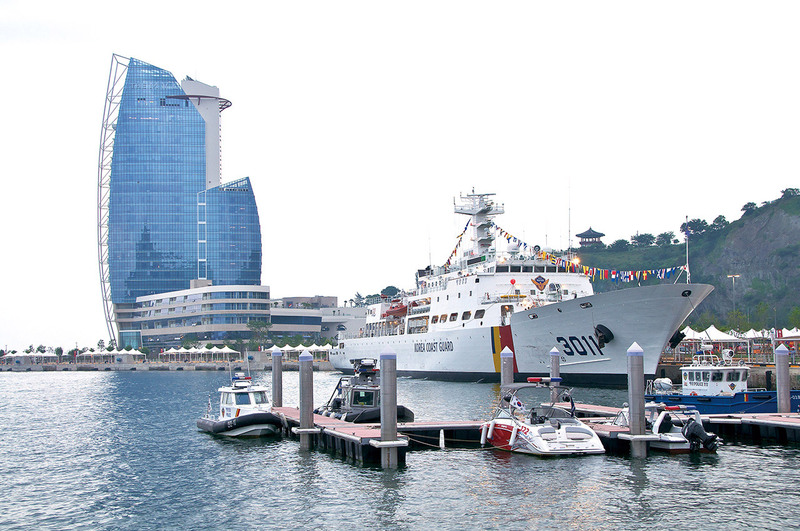 STAY> There are many options in Yeosu, ranging from guesthouses to luxury accommodations. For those interested in the latter, the MVL Hotel (T. 061-660-5800) is highly touted and located close to the Yeosu Expo KTX Station. Visitors staying in Yeocheon can find a host of options, but the B & Beach Tourist Hotel (T. 061-685-2200) has received a vote of confidence from many travelers in the city. EAT> Along with standard fare found throughout the southwest, gaejang (marinated, raw crab) is a dish that most locals will first point to when asked about Yeosu cuisine. One delicious and well-known option is Mobeom Restaurant (모범식당, T. 061-664-7770), found when walking away from the Yi Sun-shin statue and toward the ferry terminal, though a stroll through the alleys in the area will turn up a wide variety of restaurants offering seafood. Another dish commonly found throughout Yeosu is raw or barbecued fish. Sodae (sole) is the most popular in Yeosu, and fish restaurants can be found all over the city. More adventurous foodies should try Hanjeongsik – a set menu with 40 different dishes specifically from Yeosu. One local favorite for such a meal is Da Da Hanjeongsik (다다한정식, T. 061-652-0061) in Munsu-dong, located near a large wedding hall called Party Land (파티랜드). GO> Yeosu has Yeosu EXPO KTX Station that is only three hours from Yongsan Station, with trains leaving throughout the day. There are also two bus stations with the more centrally placed one being the Inter City Terminal. City buses run to all points and ferry terminals throughout the Yeosu peninsula, and a taxi from the KTX station to Dolsandaegyo Bridge will run you approximately KRW 6,000.